Isotech thermometer calibration baths employ sophisticated designs to ensure calibration to the smallest of uncertainties. In 1986, Isotech purchased the interests of H N Irving & Sons Temperature division, which had specialized in providing high-quality baths to NPL and other international laboratories. 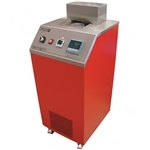 The knowledge and concepts learned from this scientific instrument manufacturer were used in the development of the Isotech 815 and 915 Parallel Tube Liquid Baths. While there is a higher cost compared to simple designs, the quality and pedigree of this thermometer calibration bath is unmatched. The key feature is the physical separation of the chamber in which the liquid is heated or cooled from the chamber that contains the calibration volume in which the thermometers are placed. The geometry of parallel tube is also important, with the shape and angle of the curves optimized for temperature uniformity. The new Libra Model 785 lab water bath achieves this with the same parallel tube assembly as used in the 915, in a different case, and now with internal refrigeration that can be used to lower temperatures. The cooling power varies dynamically, giving the benefit of greater stability at lower temperatures. Although this lab water bath has a maximum immersion of 485mm, the fluid requirement is just 8.5 liters. This helps to lower operating costs, as many other baths require a much larger fluid volume, which in turn can be costly.